← How to convert MS Office Word documents of doc to avs? How to convert MS Office Word documents of doc to tga? You can rely on a powerful document converter which is named as docPrint when you want to convert MS Office Word document of doc to tga or docx to tga. docPrint is easy-to-use, just print a document to docPrint, you will be able to start using Document Printer software. In essence, docPrint is an application in docPrint Document Converter Professional which is also called as docPrint Pro for short. There are also two available applications—GUI application which is good at batch conversion and command line application which is often used by software designers. If you want to use docPrint, you should download docPrint Pro at http://www.verypdf.com/artprint/docprint_pro_setup.exe and install it on your You can not find it on the disks but in the printer list by clicking “Start”—“Printers and Faxes”. Or you can download the standard version of docPrint which only contains the virtual printer at http://www.verypdf.com/artprint/docprint_setup.exe. After installing docPrint on your computer, you can launch it via the following steps. You should run the printer driver in the beginning of the conversion of doc to tga. Please open a word document and click “File”—“Print” to open “Print” dialog box. Then choose “docPrint” as current printer in “Name” combo box and click “OK” button. The hot key “Ctrl”+ “P” will also do you a favor to open “Print” dialog box. If docPrint is the default printer, it will be more convenient. Just right click on the word document and choose “Print” option to run docPrint directly. In “docPrint” dialog box showed in Figure1, you will see the preview of the word document in the window form. There is a small dialog box called “Option Settings” on the right. But if you want to convert doc to tga only without setting any parameters, you don’t need to care about that dialog box. Just use the ways listed below to open “Save As” dialog box. Use the icon in the toolbar. Press “Ctrl”+ “S” on your keyboard. 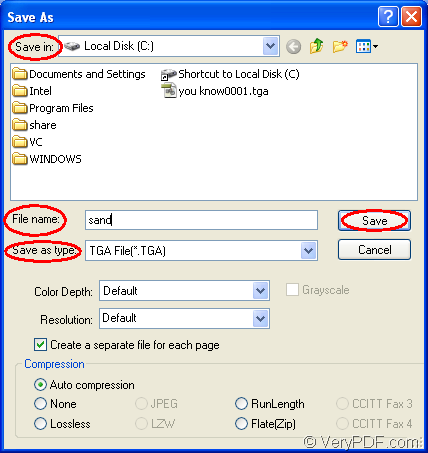 In “Save As” dialog box showed in Figure2, you can save your output file via the following operations. Please choose the location for the output file in “Save in” combo box. Then edit the name for the output file in “File name” edit box. In “Save as type” combo box, you should select the format for the output file. 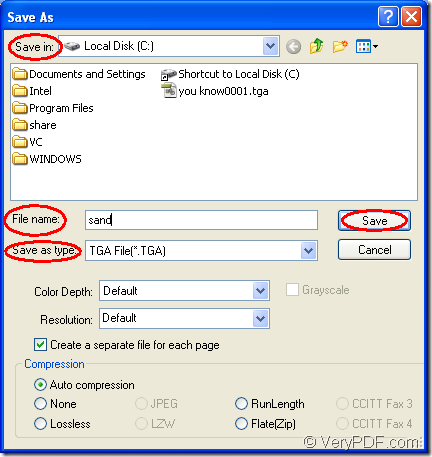 Click “Save” button the run the conversion of doc to tga. The whole conversion will come to the end in a wink and you will get the target file in the specified directory on your computer. If you still have any question about the conversion of doc to tga or docx to tga, please leave messages. If you want to learn more functions about docPrint, please visit http://www.verypdf.com/artprint/index.html. Is there any tool to convert pdf file to multipage tiff quickly with good quality ? How to print PDF files with fillable forms and checkbox items?